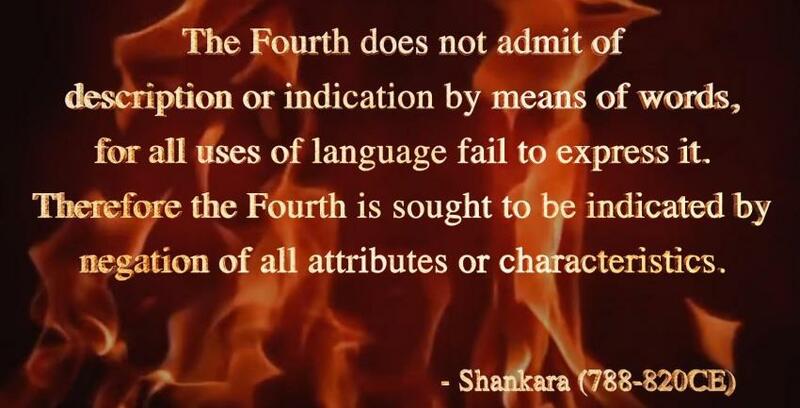 The Fourth ~ Turiya (Sanskrit: तुरीय) is the silence that precedes and follows after each of the sounds (Aa | Uu | Mm) or 'Aum' (Sanskrit: ॐ), this sound is used to represent the waking, dream and deep-sleep respectively and the silence is indicating the Transcendental Absolute. No particular form, no particular movement, no particular individuality, no particular state, can be said to be existing as such in it, for there it meets also its opposite, its antithesis, its negation, and... moreThe Fourth ~ Turiya (Sanskrit: तुरीय) is the silence that precedes and follows after each of the sounds (Aa | Uu | Mm) or 'Aum' (Sanskrit: ॐ), this sound is used to represent the waking, dream and deep-sleep respectively and the silence is indicating the Transcendental Absolute. No particular form, no particular movement, no particular individuality, no particular state, can be said to be existing as such in it, for there it meets also its opposite, its antithesis, its negation, and thus gets neutralized and fused, transmuted into a homogeneous undifferentiated whole. It is only when we cease to be fond of particulars, when we cease to be interested in this or that, when our interests and emotions are universalized, when neither of the two opposites, of the pair of thesis and antithesis, enchants us, that we can have a direct experience of this ever existing state. The very moment the finite being gives up, negates, forgets, ceases to pursue, intellectually, morally and emotionally, all that it makes it finite, the experience of Infinite dawns upon him.